Bowie Experience – A tribute to one of the world’s greatest pop icons! Bowie Experience is a spectacular concert featuring all of David Bowie’s hits – celebrating the music of one of the world’s greatest pop icons. An unforgettable journey of sound and vision through Bowie’s golden years from Space Oddity through to Let’s Dance. The Bowie Experience is an authentic tribute to the thin white duke, and it continues to amaze audiences across the globe and is a must-see for all Bowie fans. The cast pay great attention to the sound and feel of the music, all performed with the same accuracy, passion, energy and verve of Bowie himself. Complete with authentic costumes and iconic stage set projections, the show is invited to perform at festivals and theatres all over the world. Laurence is a vocalist, actor and multi-instrumentalist who has performed all over globe during the past eighteen years of touring, including performances at the official David Bowie Is Exhibition at The V&A London and The Royal Albert Hall alongside The Cure, Boney M, Roy Wood and the Boomtown Rats. 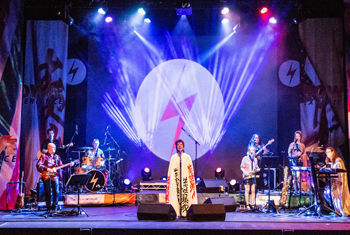 Joined by an amazing cast, this celebration concert recreates the magic of Bowie with all the hits from A to Ziggy including Space Oddity, Starman, Fashion, Life on Mars, China Girl, Rebel Rebel, Golden Years, Modern Love, All the Young Dudes, Let’s Dance, Heroes and Absolute Beginners.